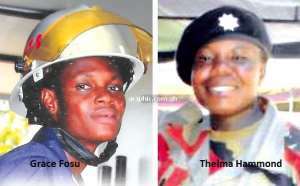 Two service officers of the Ghana National Fire Service (GNFS) who were fired in 2013 and 2014 for getting pregnant have been reinstated. Thelma Hammond and Grace Fosu's reinstatement comes after a long legal battle with the state to have their dismissal reversed because it was against their human rights. A letter by the Chief Fire Officer, Mr Edwin Blackson, to the Commission on Human Rights and Administrative Justice (CHRAJ) stated that the two firewomen “have been reinstated into the service with immediate effect”. In April 2018, the court, presided over by Justice Anthony Yeboah, ruled in favour of CHRAJ and the two fire service women that Regulation 33 (6) of the Conditions of Service of the GNFS which prohibited Fire Service women from getting pregnant within the first three years of their employment was discriminatory and infringed on the rights of women. “The women employees are, therefore, subjected to adverse treatment. The GNFS discriminated against the second and the third applicants on the ground of gender,’’ Mr. Justice Yeboah added.